officers wore head covering, with kings having jewels sewn in. A Liuyidao sword 柳叶刀 "willow leaf saber"
both cavalry and infantry during the Ming and Qing dynasties. 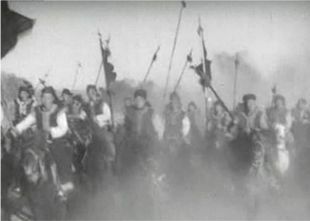 In the beginning the Taipings relied on swords, spears, jingals 抬槍 (a long, heavy musket mounted on a tripod ), stinkpots - primitive hand grenades . Traps were often hidden in the ground such as bamboo spikes. Firecrackers were used to frighten and disorient the enemy. 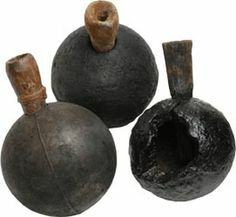 Stinkpots, An earthenware jar containing combustibles emitting a suffocating smoke. 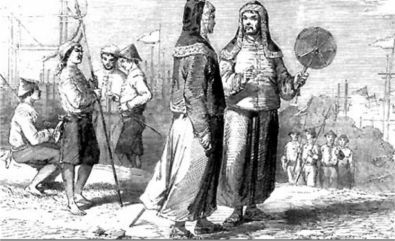 More modern weapons were purchased from foreigners, but supply was a problem, one of the reasons for failure of the Eastern Offensive toward Shanghai. The Taipings were weak in cavalry, often depending on Nian ( 捻 ) rebel cavalry. 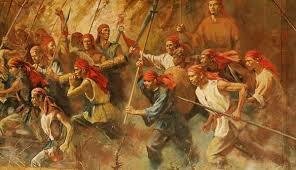 Nian ( 1851 - 68 ) and Taiping rebels joining forces to fight the Qing . The Nian rebels in eastern China were famous for their fast moving cavalry attacks . If the Taiping and Nian rebels could of cooperated more effectively, they would have had a good chance to topple the Qing . Watch the movie here . Both the Taipings and Qing were master at making earthworks and defensive positions. 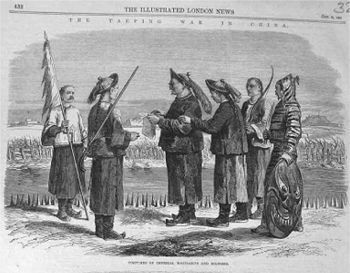 The Taipings had many miners from Guangxi in their ranks, who were put to use to sap city walls. 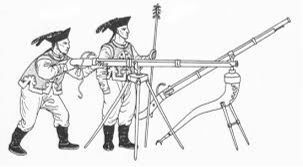 Besides the above-mentioned weapons, many men from the northern provinces were armed with the Tartar bow, which was a much more accurate shooting weapon than either matchlock or jingals. skills as a way of preserving their culture . 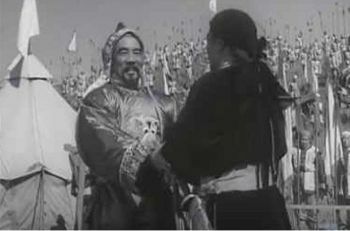 Each Taiping Wang or Prince has under his special control 100,000 people, including one army. Between the Wangs and generals of armies come nine descriptions of officers, ranking as ministers, and other great officers in charge of civil and military departments of state. The military organization and all the titles, are those used previous to the conquest of China by the Manchus. 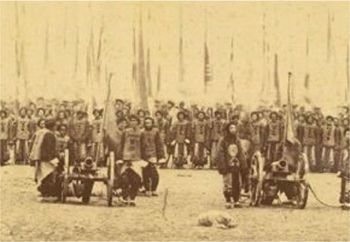 Each Taiping army, or keun, is composed of 13,125 officers and men, under the command of a general (keun-shwae), and is divided into five divisions (ying), front, rear, right, left, and center. A division musters 2,625 strong, commanded by a general of division (sze-shwae), and contains five leu, or regiments, the front, rear, left, right, and center. A regiment is composed of 525 men and officers, commanded by a colonel (leu-shwae), and is divided into five tsuh, or companies. A company is composed of 104 men and officers, commanded by a captain (tsuh-chang) ; then come four lieutenants (Liang Su ma), distinguished as the north, south, east, and west, each in command of four sergeants (woo- chang), and twenty privates (woo-tsuh). The lieutenants, and all above, have each a banner with his designation inscribed on it, which increases in size with the rank of the officer. Each division of an army is divided into three classes, or brigades. The first consists of bonafide Taipings, that is to say, all who are of more than six years' standing; the second brigade, of more than three but less than six years' service; while the third, and generally largest brigade, includes all new levies, and less than three years' service men. Each brigade is again divided into three classes. The best and bravest men are armed as musketeers, or cavalry; the next class as heavy jingall and halbert men; and the third as spearmen. The Taiping military plan was greatly influenced by the Book of Zhou or Zhouli ( 周書 ). This was an idealized blueprint for a militarized society from the ancient Zhou Dynasty ( 1046 - 256 BC ). With the revered Book of Zhou lending its weight, the Taipings could tight knit group of farmer-soldiers, led in 25 person teams by the Liang Su ma . These farmer-soldiers lived and worked together, putting all their property in the common treasury . The penalty for not contributing everything to the common treasury was beheading . Each division of an army is divided into three classes, or brigades. The first consists of bond fide Taipings, that is to say, all who are of more than six years' standing ; the second brigade, of acknowledged brethren, of more than three but less than six years' service ; while the third, and generally largest brigade, includes all new levies, and less than three years' service men. Attached to each division of guards (or the first class of the three brigade divisions) is one large black flag, and when this is advanced, the division is compelled to follow it upon pain of death, the rear rank men carrying drawn swords to decapitate any who might attempt to run. One of the wisest and most advantageous regulations of the Taiping army is, that officers of every grade could rise by merit alone ; a regulation highly beneficial, most of their leaders having proved very superior men ; among others the Chung-wang, who, unaided, rose by his brilliant attainments alone to the highest military rank. Until the appointment of Zeng Guofan, this was not the case in the Qing army, which had decayed greatly since conquering the Ming in 1644. To serve in the army had no prestige, and only those who could do nothing else sought army service. Many of the soldiers were addicted to opium and positions could be bought from the cash hungry Qing court . The early Qing military was rooted in the Eight Banners first developed by Nurhachi as a way to organize Jurchen society beyond petty clan affiliations. There are eight banners in all, differentiated by colours. The banners in their order of precedence were as follows: yellow, bordered yellow (i.e. yellow banner with red border), white, red, bordered white, bordered red, blue, and bordered blue. 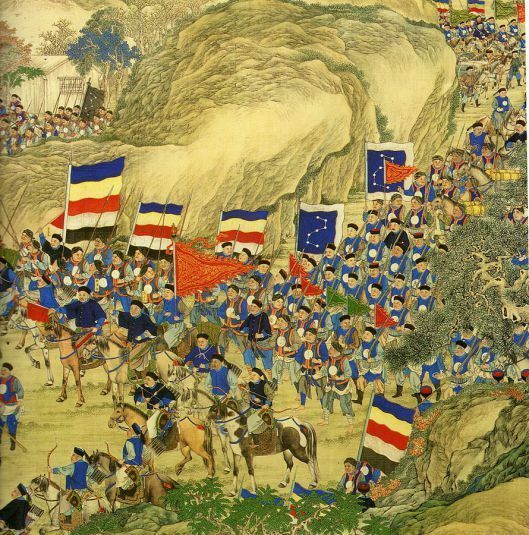 The yellow, bordered yellow, and white banners were collectively known as the 'Upper Three Banners' (Zh: shang san qi 上三旗) and were under the direct command of the Emperor. Only Manchus belonging to the Upper Three Banners, and selected Han Chinese who had passed the highest level of martial exams were qualified to serve as the Emperor's personal bodyguards. The remaining Banners were known as "The Lower Five Banners" (Zh: xia wu qi 下五旗) and were commanded by hereditary Manchu princes descended from Nurhachi's immediate family, known informally as the "Iron Cap Princes" (Zh: tie maozi wang 鐵帽子王). Together they formed the ruling council of the Manchu nation as well as high command of the army. Click for a larger image . arly during the Taiping rebellion, Qing forces suffered a series of disastrous defeats culminating in the loss of the regional capital city of Nanjing (南京) in 1853. The rebels massacred the entire Manchu garrison and their families in the city and made it their capital. Shortly thereafter a Taiping expeditionary force penetrated as far north as the suburbs of Tianjin (天津) in what was considered Imperial heartlands. 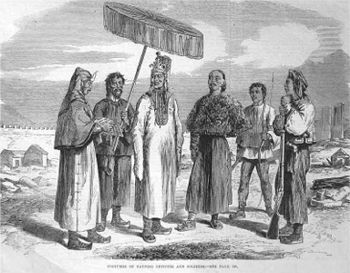 In desperation the court ordered a Chinese mandarin Zeng Guofan (曾國藩) to organize regional and village militias (Tuányǒng 團勇 and Xiāngyǒng 鄉勇) into a standing army called tuanlian to contain the rebellion. Zeng's strategy was to rely on local gentries to raise a new type of military organization from those provinces that the Taiping rebels directly threatened. This new force became known as the Xiang Army (湘軍), named after Hunan region where it was raised. 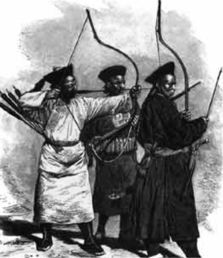 The Xiang Army was a hybrid of local militia and a standing army. It was given professional training, but was paid for out of regional coffers and funds its commanders—mostly members of the Chinese gentry—could muster. The Xiang Army and its successor the Huai Army (淮軍) created by Zeng's colleague and pupil Li Hongzhang (李鴻章) were collectively called Yongying (勇營). 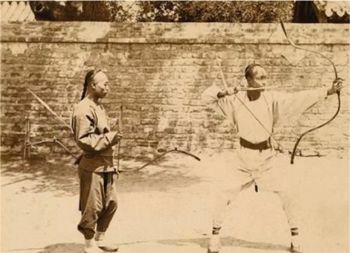 Prior to forming and commanding the Xiang Army, Zeng had no military experience. Being a classically educated Mandarin his blueprint for the Xiang Army was taken from a historical source—the Ming Dynasty General Qi Jiguang (戚繼光) who, because of the weakness of regular Ming troops, had decided to form his own "private" army to repel raiding Japanese pirates in the mid-16th century. Qi's doctrine was based on Neo-Confucian ideas of binding troops' loyalty to their immediate superiors and also to the regions in which they were raised.